This week, Pilgrim is officially introducing a new fully-validated solution called SmartSolve® Out Of Specification Management. Managing out-of-specification (OOS) results is a critical area of focus among pharmaceutical and combination product manufacturers. To help you understand the critical nature of this operational element, we’ve created this Q&A about compliance facts and insights on data integrity, and commonly used acronyms that relate to OOS. Let’s begin with the basics. Question: What is OOS and what does it mean? Answer: The simple definition of Out Of Specification, or OSS, is when a product or drug is not meeting documented standards. The item produced is outside of the specifications the manufacturer has set for the product. The official definition of OOS is “A specification (often abbreviated as ‘spec’) is an explicit set of requirements to be satisfied by a material, product, or service. Should a material, product, or service fail to meet one or more of the applicable specifications, it is referred to as being out of specification.” The term Out of Specification is used by drug manufacturers to ensure that products are produced within the defined specifications. The Federal government compels drug manufacturers to adhere to testing regulations and guidelines to ensure that all of the drugs are produced according to the drug master file (DMF). Question: Is OOS a factor in a company’s quality system compliance? Answer: Yes! When a drug manufacturer fails to record, investigate, and resolve their OOS findings, then this drug manufacturer receives a warning letter from the U.S. Food and Drug Administration (FDA). The FDA has the power and authority to stop production, and in some cases to arrest companies’ executives. The safety and health of the public is at the core of the FDA’s mission. Every pharmaceutical organization has a reputation to maintain for producing high quality drugs, active pharmaceutical ingredients (APIs), excipients, and other drug components. Yet unexpected batch failures and test result discrepancies can occur. When they do, proper investigations must be performed to understand the root cause of each out-of-specification result. Question: What aspects of the OOS process are typically examined during an FDA audit? Answer: When the FDA audits your business, its eyes are on key records, such as whether your staff is properly trained; if your test procedures are properly defined; or, if there may be a design flaw allowing more results to pass than should. Managing consistent OOS investigation results can help you identify gaps in your quality system so you stay compliant and work toward continuous improvement. For example, are you seeing an increasing number of OOS results from a specific supplier’s materials? It may be time to audit that supplier or your contract manufacturing organization (CMO). Question: I hear about data integrity all the time. How does data integrity relate to OOS results? Answer: Data integrity is a critical factor for the pharmaceutical industry. Unfortunately, a trending citation in FDA warning letters and regulatory actions is laboratory data integrity. The first FDA warning letter for fiscal year 2016 cites a “failure to have computerized systems with sufficient controls to prevent unauthorized access or changes to data.” A key component to any quality management system and current Good Manufacturing Practices (cGMP) requirements is tracking test results, out-of-specification results, and investigations to support and reinforce your firm’s data integrity and reputation. Good data integrity ensures your customers know that your market-released products have been manufactured exactly as designed, and with the correct potency and purity. Question: There is another acronym related to OOS called OOT. What is OOT and why is it important? Answer: OOT is an acronym for “out-of-trend”. It is the comparison of many historical OOS data values over time. OOT reporting and investigations focus on understanding non-random changes and trends. OOT analysis can help you identify potential problems sooner in your process and acts as a catalyst for continuous improvement. For example, if your data shows a growing number of OOS results from a particular lab analyst, it may be a warning to review training, or the test design itself. Likewise, if the data shows a growing number of out of spec results from materials produced on one piece of equipment, it may be time to review the maintenance and calibration schedule for the equipment. Question: How is the OOS process usually managed? Answer: While testing results are normally captured in a laboratory information management system (LIMS), there is often a gap for tracking OOS result investigations. Many investigation processes are paper-based or are managed in Excel. This can pose challenges during an FDA audit, as investigation results and related records can be difficult to locate in a timely manner. Question: How can Pilgrim’s solutions help manage OOS test results? Answer: Pilgrim SmartSolve® Out Of Specification Management makes the OOS investigation process simple, consistent, and compliant. The solution provides a closed-loop workflow to document, verify, and investigate out-of-specification test results. Plus, the system’s built-in investigation process mirrors the FDA guidance for two-phase OOS investigations to help maintain compliance. Having a consistent, compliant process for tracking your OOS test results can keep your quality system audit-ready. When you can prove compliance, demonstrate consistent investigations, and easily retrieve the right information from your system, you’ll always be prepared for an FDA inspection. SmartSolve® Out Of Specification Management helps you ensure consistent out-of-specification (OOS) lab result investigations. Watch this short video to learn the basics. 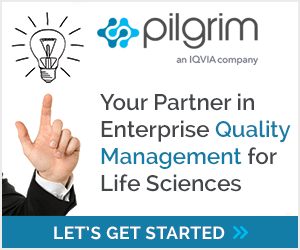 Pilgrim pioneered quality management software more than 25 years ago for regulated enterprises that needed a better way to deliver, track and oversee quality-related activities. Your email address will not be published. Please fill out all required fields.